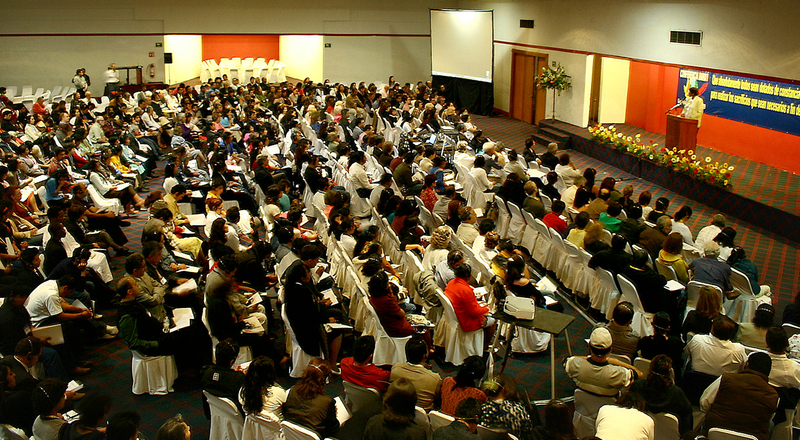 From the length and breadth of Mexico – from Baja California in the far northwest to Chiapas and Quintana Roo in the southeast – came the 600 Baha’is who participated in the regional conference in Guadalajara, Mexico’s second largest city. The folk rhythms of the drums and jaranas of the Gulf coast regions welcomed the friends to the gathering, held on 10-11 January at a hotel in downtown Guadalajara. The previous day, buses had been arriving from all directions. The believers from Yucatan, with many Mayan friends, rode for 30 hours from their very warm peninsula through the icy cold mountains to reach Guadalajara. 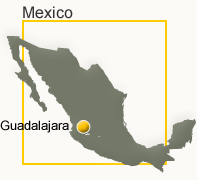 Another bus started in the coastal areas of Veracruz, then passed into the mountains to pick up almost 30 Nahuatl-speaking Baha’is from the Huasteca area. One man from Yucatan said he sold off his cattle to pay for the trip. People were called to each session with foot-tapping, hand-clapping rhythms from Veracruz. Prayers were recited and sung in Spanish, Mayan and Nahuatl – mostly by the youth and junior youth. The representatives of the Universal House of Justice, Mr. Juan Francisco Mora and Mrs. Rachel Ndegwa, both members of the International Teaching Center, were warmly and enthusiastically received, as were Continental Counselors Ana Hilda Lemus and Rodrigo Tomas. Mrs. Ndegwa inspired everyone with her opening comments, which were followed by a report from the National Spiritual Assembly of Mexico that was a celebration of what has been achieved up till now. Fifteen youth volunteers worked hard to keep things running smoothly, including helping to divide people into 20 workshops to read and study messages from the Universal House of Justice, including the 20 October letter to the Baha’is of the world. A separate message from the House of Justice specifically to the conference set the tone, reviewing what has been achieved and all that remains to be done before the end of the current five-year plan. 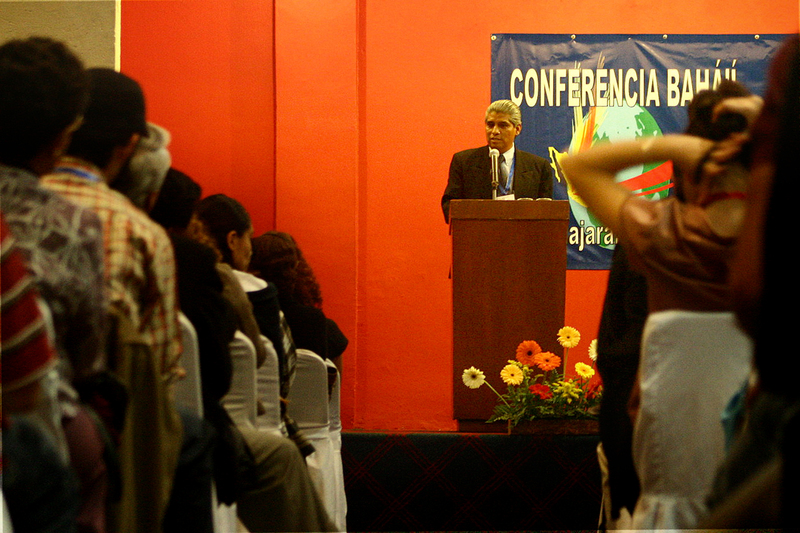 Mr. Mora addressed the conference about the process of community-building at the local level. He described the establishment of a devotional meeting or any other core activity as “expanding the transforming influence of the Faith,” and he encouraged the Baha’is to create the habit of having conversations about important spiritual topics. Among those who shared personal stories was Jose Guadalupe Molina from the state of Aguascalientes. He told how his life had been transformed when he began the sequence of institute courses, doing the related activities and drawing members of his family into the process. He described how, with the help of other people, he set up a meeting with his grandparents, aunts, uncles, and cousins who live in another town, and how they eventually formed their own study circle in that locality. 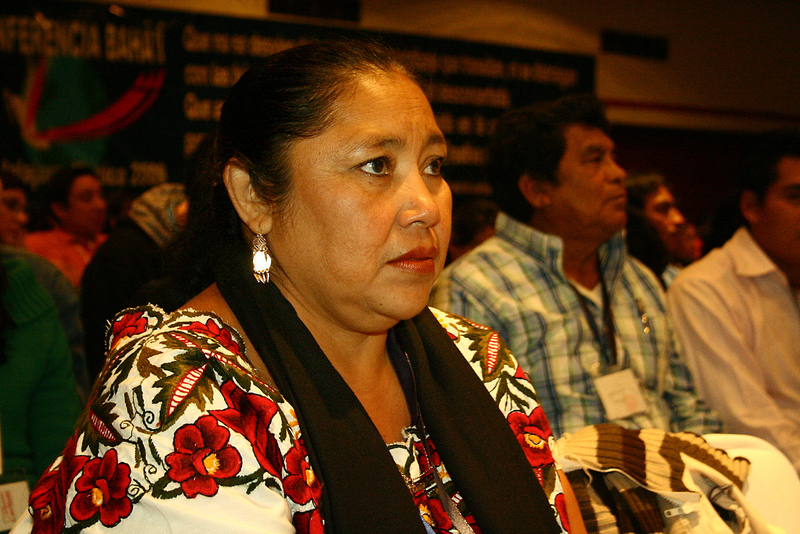 Patricia Ramos from Colima told how she first heard about the Baha’i Faith 11 years ago but didn’t actually join the Baha’i community until three years ago. In the intervening period, however, she saw the need for a devotional meeting in her neighborhood. “It has now been going on for four years, every Friday and Sunday, and has brought us all many blessings,” she said. Her sons and daughters-in-law are now part of the Baha’i community, too. 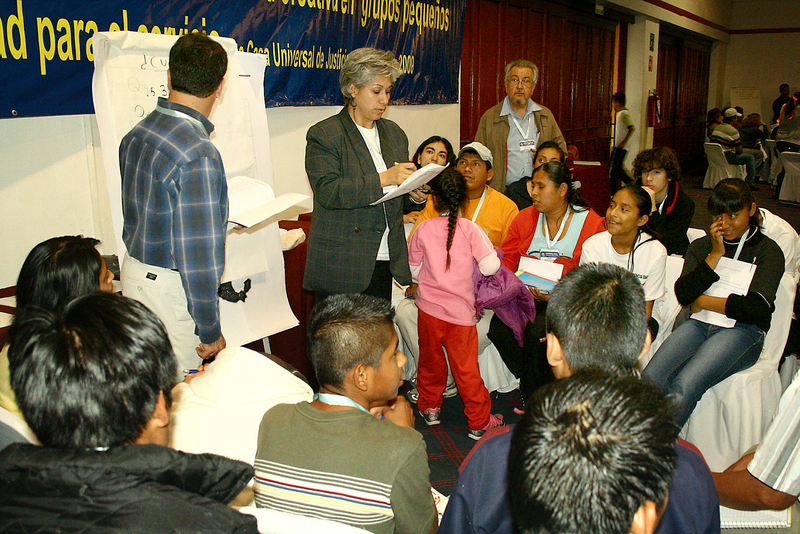 Juan Manuel Ortiz, also from Colima, told how he and his wife had gone through the sequence of institute courses and at one point began to realize the importance of working with children and young adolescents. They were a bit unsure how to begin, but a group of youth from their own community and elsewhere accompanied them from house to house in their neighborhood to talk to the parents and invite their sons and daughters to the activities. Mrs. Ortiz is now a children’s class teacher, and Mr. Ortiz an animator of a junior youth group. “It has been exciting for us that other people see the changes in the children,” he said. 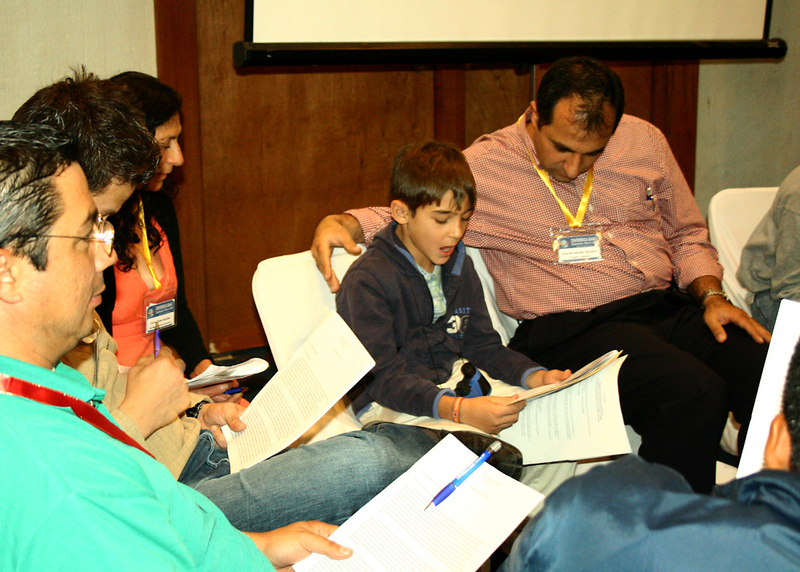 Gonzalo Moreno, 13, from Aguascalientes told the gathering how he had encountered the Baha’i Faith through attending a children’s class. “I was impressed with their humbleness and how they treated me,” he said. A couple of months later, his parents were invited to a devotional gathering, and they also liked it. 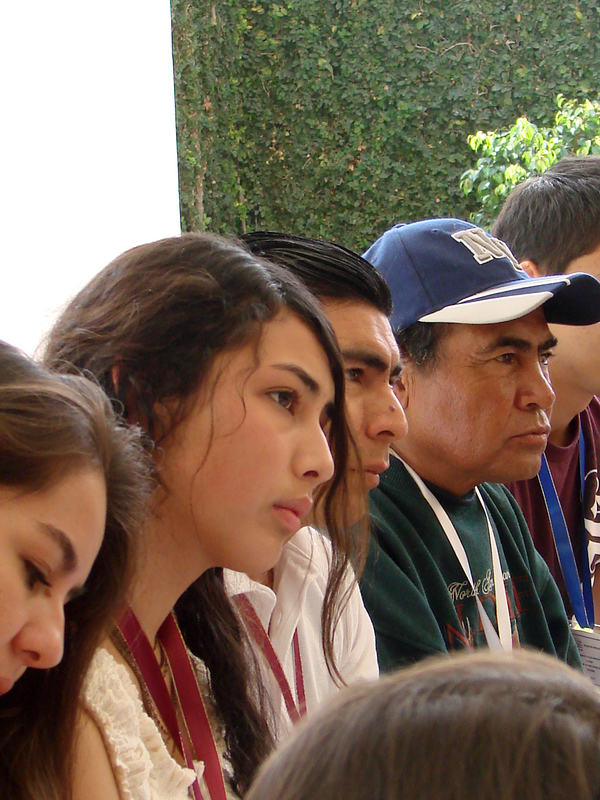 Gonzalo, his parents and his brother all joined the Baha’i community. Gonzalo progressed to a junior youth class, joined a team that travels to assist other communities, and has a goal of establishing a children’s class himself. Silvia Serrato of Guadalajara spoke of her work with a children’s class that lasted for a year and then became a junior youth group. She said one thing she learned was the importance of developing relationships with the parents of the youngsters. Abigail Zarate from Ensenada in Baja California spoke about the ups and downs of their activities, noting that they have “good cycles and not-so-good cycles.” But there was always some kind of progress. “We have to be very disciplined to be successful in our goals,” she noted. The last session on Saturday was devoted to cultural and artistic presentations. The program included music and dance – mainly from Mexico but also from Africa – as well as theater, video, and a presentation by a clown that highlighted moral and spiritual virtues. Sunday morning dawned with everyone ready to channel the emotion of the first day into concrete action. Counselor Rodrigo Tomas spoke about the development of activities in Mexico – how four intensive programs of growth are already under way and three more are planned by April. But he explained how more are needed. After the talk, participants divided into 13 workshops to consult about specific communities and how best to advance the work. 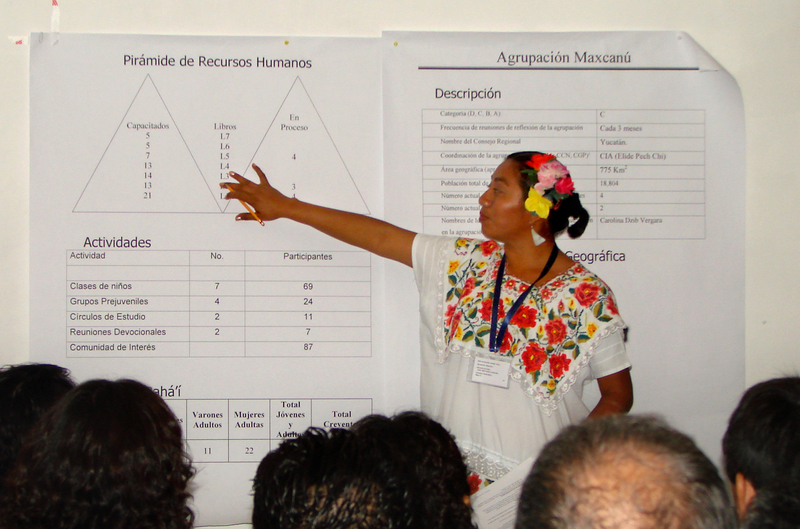 As a result, some of the goals were adjusted upwards, and many people made commitments to establish new study circles, children’s classes, junior youth groups, or devotional gatherings, or to move to other communities that need assistance. The representatives of the House of Justice concluded the conference, with Mr. Mora offering moving words of encouragement, and Mrs. Ndegwa calling on the believers to reach for higher levels of sacrifice. Spanish was the main language of the conference, although some of the participants also spoke Mayan or Nahuatl. All the regions of Mexico were represented among the 600 participants. Throughout the conference, participants were treated to stories from the various regions as people shared their experiences with Baha’i core activities. 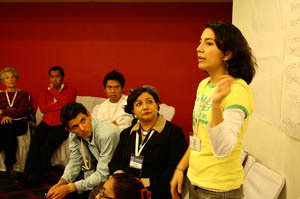 Young people have been prominent participants at all the regional conferences. 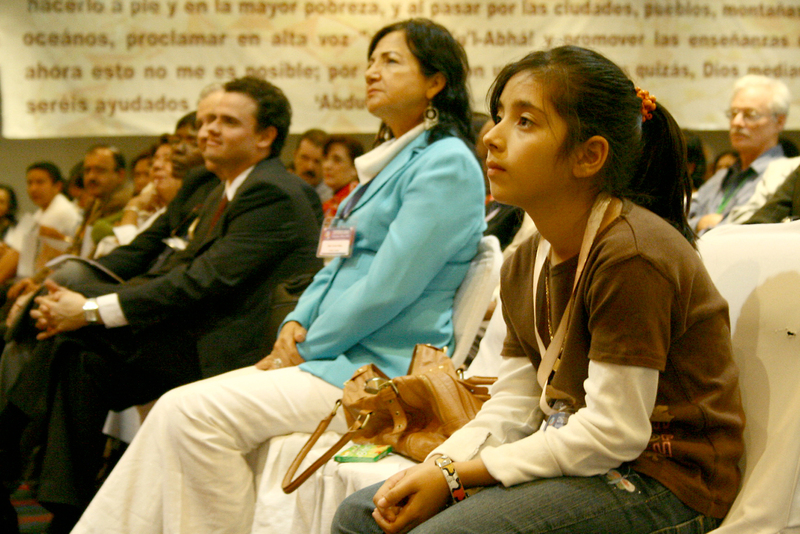 A young girl listens intently during a plenary session. Older people and younger people, new Baha’is and veterans – all consult together about how they can contribute to community-building activities. 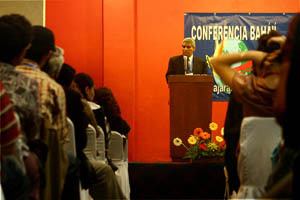 The second weekend of January represented the 11th consecutive week of regional conferences around the world. 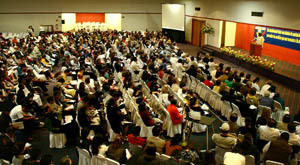 A total of nearly 50,000 people have attended the 27 conferences to date. 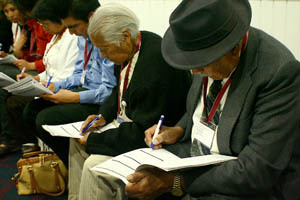 Workshop sessions focus on specific communities and regions. 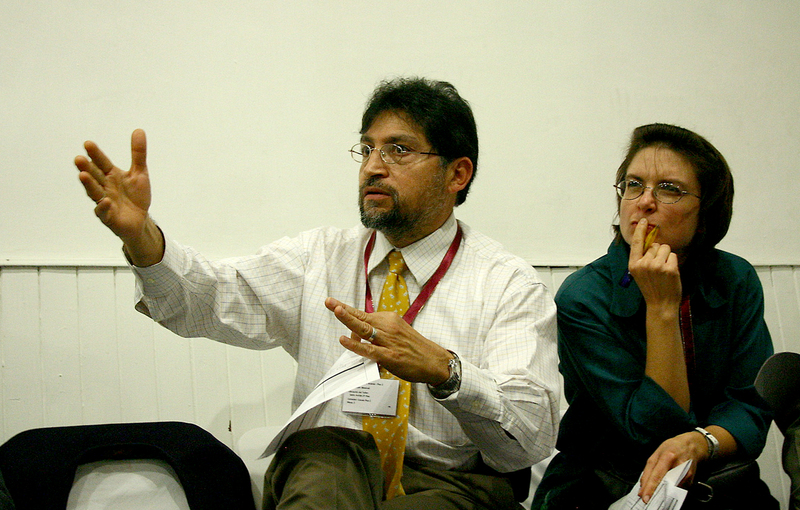 In small breakout groups, people discuss how they can help each other advance their activities. Youngsters often participate in the consultations right along with their parents. 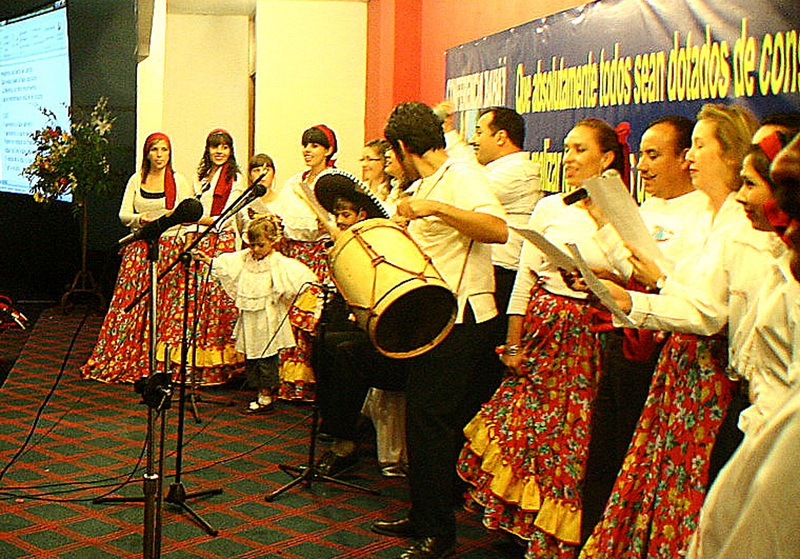 The rhythms of Mexico were heard often during the conference, including at this presentation on Saturday night. 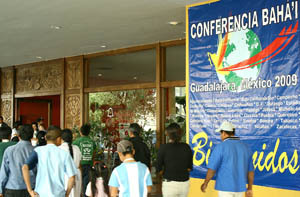 The conference was held at a hotel in downtown Guadalajara, the second-largest city in Mexico. Video clip: A Baha’i song.